A TRUE GEM ! 4 bedroom ranch on over 2 acres of land with a 50x35 ft detached 3 bay shop /garage! an 18x36 in ground pool (chlorine pool) , this home is a one owner home , very open floor plan in a nice setting . No HOA , close to North Greenville University with a seasonal mountain view ! 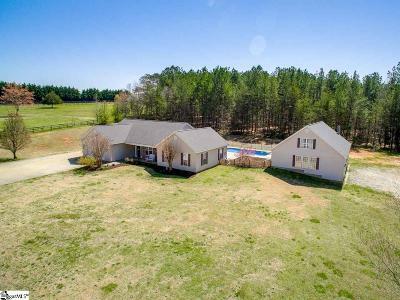 Situated on a nice 2 acre private lot with an inground pool, pool house , sauna and a large 50x22 bonus room/ teen hangout / storage space over the garage! The detached shop offers a separate driveway, separate water meter and electric as well, a cedar sauna , bathroom and pool storage room , which are all located in the detached garage with access to the the pool itself. relax on the country front porch with a mountain view, or enjoy the sights and sounds nature in the back yard and by pool!